Medicinal uses: A digestive and tonic herb, it has a wide variety of traditional uses. Milder in action than most Artemisia species, it can be taken over the long term at a low dose to improve appetite, digestive function, and absorption of nutrients. In addition to encouraging the elimination of worms, mugwort increases bile flow and mildly induces the onset of menstruation. Mugwort is also an antiseptic and has been used in the treatment of malaria (Chevallier 173). 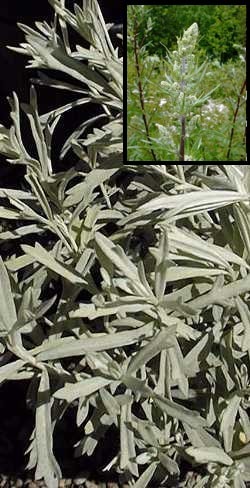 Additional uses: Mugwort leaves have a sage-like smell and are used to repel moths. The plant dries well and can be used in less formal herbal arrangements (Kowalchik 392). Cautions: Do not take during pregnancy (Chevallier 173).